If worries about digital transformation projects keep you up at night, imagine how it would feel to be responsible for moving thousands of internal databases to the cloud for a company with more than $160 billion in annual sales and 260,000 employees. That's the job that ATT Communications CEO John Donovan is undertaking, and he's working with Oracle CEO Mark Hurd to do it. When the companies announced in May that they were working together, Hurd called the agreement "historic." While hyperbole is part of everyday life in tech, lessons learned from the massive project are bound to reverberate across enterprises in a variety of fields, as Hurd noted in the following discussion with Donovan and IDG News Service Editor in Chief Marc Ferranti. ATT, the biggest telecom company in the world by revenue, had already plunged into virtualizing and software-controlling its wide area network. The goal is to virtualize 75 percent of its core network functions by 2020, hitting 55 percent by the end of this year. The move to bring its databases to the cloud, meanwhile, will allow it to knock down information silos, achieve greater operational efficiency and innovate new products and services. Oracle, meanwhile, has been knocked for being late to the cloud, allowing IaaS (infrastructure as a service) leaders like Amazon, Google and Microsoft to scoop up customers. But over the past year it introduced its Generation2 IaaS offering, forged ahead on regular updates to its SaaS (software as a service) line, and polished up its Cloud at Customer offering, which lets enterprises put data and applications behind their firewalls while taking advantage of cloud pricing models and technology. This was important for ATT, which must be mindful of regulatory requirements for customer data. In the following discussion, edited for publication, Hurd and Donovan talk about working together on what they (half-jokingly?) refer to as the lunatic fringe of digital transformation. IDG: “Collaboration” is a term sometimes used for basically straightforward business deals: a customer pays a vendor for products and services. You’ve called this a collaboration – in what sense is the Oracle-ATT deal a true collaboration? John Donovan: In this case we didn’t buy what Mark was selling off the shelf. We didn’t look at where Oracle was. We looked at what we were trying to accomplish as a company, how vast the job at hand was, and then we looked at the evolution and the architecture of what Oracle was doing in their cloud strategy in order to find a territory where we could buy and they had to build. Oracle is going to address our specific need: How do you tear down a massive database and regionally distribute it so that you can be really fast in how you’re managing your IT application changes that rest on top of this data? Secondly, on our side, it changes fundamentally how we do things – we don’t have to waste our energy and time now on one by each for 40,000 databases deciding how we’re going to migrate to this new architecture. We created an economic construct and a technical construct that allows my team to focus on how you get it done instead of what are we gonna do and who are we gonna do it with. So I think we met at a point where Oracle has to build a world- class database roadmap to migrate an extremely large company from fixed databases to clouds. That in my view is what collaboration is defined as. IDG: Mark, did you have to change the underlying technology architecture of your infrastructure as a service offering or your platform as a service offering to get this deal done? 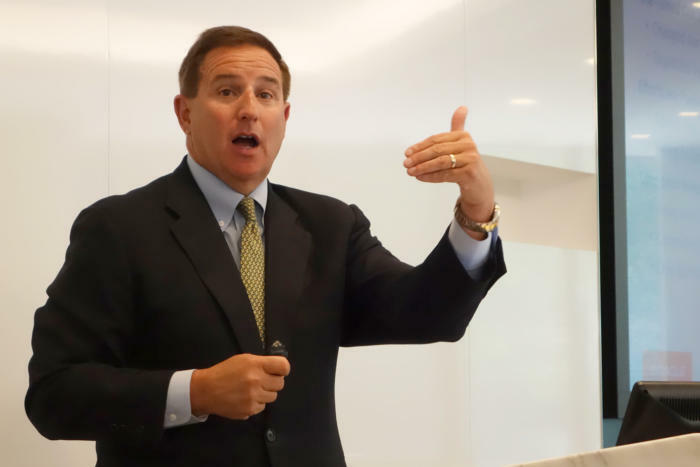 Mark Hurd: Well we’ve rewritten all of our technologies including Database itself for the quote/unquote cloud, so that’s true with the new infrastructure offering, all of our platform offerings including Java analytics, Database, etcetera. Now in addition to that, to John’s point, we did some other things in this that were probably unique, meaning that we took what we do in the public cloud and we’re actually bringing that to ATT – we do the patching, we do the managing, etcetera. And then we have a joint team together that’s doing the migration of many of these legacy databases that John described over to the modern database architecture. So it’s both RD, product development, some unique things that we’re doing for ATTT, to make all of this happen. John Donovan is CEO of ATT Communications. IDG: So just to clarify -- are the databases going to the public cloud or are they going to the Cloud at Customer offering. Or is it a combination of both? Donovan: From ATT’s perspective, certain data has a regulatory requirement that it sit inside our walls. Other data is capable of being moved to Oracle’s cloud and being consumed as a service. In addition to just looking at databases we also looked at applications, and within applications, capabilities like AI and machine learning, where we could create derived data – and some has to sit on premises, some off. We’re comfortable that we’ve partitioned the things on prem that need to stay on prem. Then we have this added dimension of having this stuff secure in motion. So our data is secure at rest and it's secure in motion whether it is in our data center or in an Oracle facility . Hurd: That’s a really good description of the benefits of Cloud at Customer because you now have the same version of our public cloud that will actually be here at Customer Cloud so we can move data back and forth to the public cloud as ATT so desires. It really gives us the benefit of taking all of these benefits of the cloud to the customer and the ability to burst and move data back and forth seamlessly as we go forward. One other point John brought up which I think is interesting is that it also gives us a platform now for all of our modern applications to sit on this infrastructure as well, integrated with AI, integrated with analytics. IDG: So, some data can sit in the public cloud, some data will be on prem in Cloud at Customer depending on your requirement and compliance requirements. 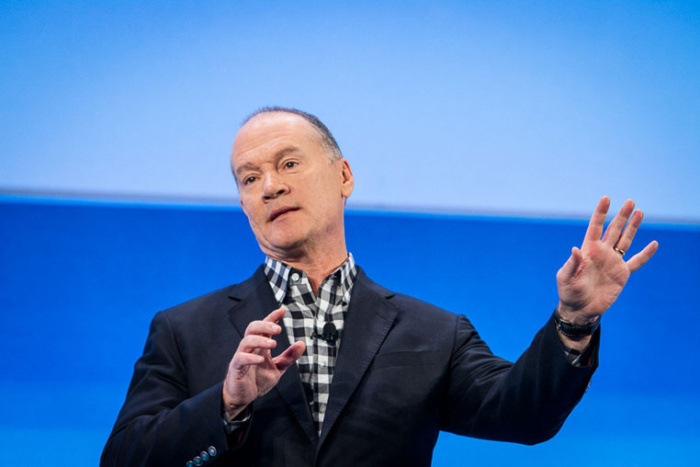 Donovan: Right and so think about the friction that’s removed now; my folks can say, "Which is more apropos for the business – does it fit the regulatory, in-house requirement or can I use the off prem cloud and use some combination of our data and Oracle’s learning to use ML and AI to improve a process?" There’s some processes that we want in the cloud inherently because we want to capture the learnings of that function globally. Other stuff will be propriety, so on-prem – not only regulatory stuff but what we would call secret sauce. IDG: You suggested that compromises needed to be made on both sides. Can you talk about that, and about how you are orchestrating this massive move. Donavan: One big concession for us was to feel comfortable we could take databases that were over 8 terabytes -- and there’s a generally prevailing view out there that the incentive for Oracle is to keep those big and centralized -- and get a really crisp understanding of how we go highly distributed and how we can really touch the applications all the time and not have to worry about the architecture, the roadmap or the process of how we’re going to do that. To me was a really big deal and kind of the game changer. Having a collaboration with a company where you have confidence you can do that was a big deal for us. Hurd: I would add to it that this place, being ATT, is on the lunatic fringe in terms of scale. One stat John gave me that I always remembered was that these databases have a huge percentage of the company’s data so our ability to get that updated, modernized, is a big project. The reason that this is so strategic for us is that I think that regardless of scale this is what most of our customers are gonna do. They want to do exactly what John described and maybe they don’t have databases of 8 terabytes or bigger, but the banks, any of our customers -- they’re faced with the same issues. Part of what the two of us are doing together is we have a team here doing that work with John’s team. This is obviously a great place for us to do this work, to create a tremendous reference, build our own skills and our own capabilities. My point here is this is more than a deal; this is a longer-term relationship that I think goes directly strategically to not just what John described ATT doing but what I think the broader market is going to do. IDG: John, technology is just one piece of transformation. Companies say that a cultural or mindset change is required to think about your operations and processes in a new way – how do you tackle the cultural issue in your organization, in terms of change? Donovan: We’re trying to move from a hardware-centric communications company, and the technical skills required to do that change dramatically. And at our scale we can’t just go and just say oh, I’m gonna hire a few of those. You’re talking about tens of thousands of employees to reskill. And so when Mark was talking about the lunatic fringe I thought he was talking about willing to go down the path of trying things at big scale and be first. If the mother of invention is necessity then the mother of emergency is getting started, being out at sea and needing a cultural shift plan. I’ll just tell you right now we have nearly 60,000 people that have earned internal badges to build competencies. We’ve had over 2 million hours of competency-based training skills. We have two and half million courses completed and people are starting to, by the thousands, move from skill A to skill B -- and skill B is a job for the future that’s gonna be around awhile. So I would say that that has taken our workforce from being culturally afraid of change to embracing change and looking at it as a career enabler. I feel like our enthusiasm is correlated to our skill shift and that pivot has been necessary but also really transformational for us. Oracle CEO Mark Hurd talks to reporters at Oracle headquarters in 2015. IDG: Mark, what are customers telling you about the challenges they’re experiencing? Hurd: Somebody might say they’ve deployed a lot of Oracle Database in their environment and mention different versions of the Oracle database. You’ll find they have different features in each of those databases, different scale databases. So for something as simple as standardization of security, our on-premise customers are roughly 14 months behind us just in deploying patches. You might say that sounds crazy, why would they be so far behind? I’ll tell you why – it’s really hard. Because you have all different versions of databases running on different operating systems, different versions of hardware. All of those have to get sequenced in terms of patching. Given what John and I are doing, that problem goes away. IDG: John, how would you measure success in what you’re doing, in your transformation efforts are there particular metrics you’re using? Donovan: All things technology translate to speed, cost and quality. If you look at just getting more highly distributed, our biggest benefit as a company is speed. We measure that two ways. The number of projects that are being completed in under six months, the number of projects completed in under a year -- those numbers have gotten dramatically faster. Secondly, we measure how much of the code base is able to be touched monthly or biweekly, instead of on a big release schedule, so that we can get to near real-time. It’s our plan to work ourselves away from triannual to monthly, from monthly to biweekly and biweekly to weekly. Time is our silent killer. The more time it takes, the more meetings, the more costs and so rust starts to develop over time. Speed for us is where most of the economics are. With speed we’ll get cost and then we just have to make sure we keep our quality standards up. I don’t worry much about that – we’re an industry and a company that was born on five nines. IDG: Can you talk a little bit more about how are ATT and Oracle are orchestrating this shift? It would be instructive to have a window into how you’re working together. Donovan: Like most things, you start on database number one and you go to database number 40,000, and there’s no real shortcut. You have to put a work plan together that’s gonna last a few years. And so you say if we want to get good at this we have to very quickly get one of each type done. So we get our learning, our scar tissue and then, once we do that, we get the low-hanging fruit. You want the easier-to-do, bigger-benefit stuff, right away. And then work through the big benefit stuff and get smarter and better and part of our collaboration and partnership is we work side by side on this, so what we don’t know, they help with. What they are developing along the way will be tools and processes that make this better so every database we migrate to a modern architecture will happen faster and cheaper and then literally we’re gonna mow through all 40,000 and it’s gonna take a few years but we’re specialists at these project plans and we’ll set a timeframe that’s aggressive but doable. We sit down together and work on getting that plan put together. Hurd: When you blend the ATT and Oracle teams it’s one team, no one’s got a badge that says Oracle or ATT. It’s one team with a common mission to migrate and modernize all of this infrastructure. For us, every time we do one we’re gonna get better at the second, then better at the third, better at the fourth and we’re gonna do nothing but get better and better. We’re gonna have incredible expertise built as we do this. I think the fact of John’s point about the lunatic fringe and trying new things that scale speaks to the heart of this. We have a customer on the lunatic fringe of scale that’s simultaneously trying new things at that scale. I don’t know what percent of data in this country is in big corporations -- a very very high percentage (is) in the Oracle database. The competencies built out of just this project alone, at scale, isn’t just gonna benefit ATT, isn’t gonna just benefit Oracle, it’s gonna benefit all of those customers in the market and so when you look down the road three, four, five, six seven years, there’s gonna be a slew of engineers that have come out of this project working across all of corporate America. IDG: John, what differences will your end customers see from this? Donovan: Take workforce management for our dispatch function. We have 70,000 truck we dispatch every day – one of the largest fleets in America – and administratively it takes thousands of people to get those delivered effectively to customers. So on the efficiency side of it, if we’re rapid and nimble, we can change dispatch strategies tonight and have it implemented tomorrow. We can start to think about not only what did we learn yesterday and how can we get smarter, we can bring in third-party data that allows you to do things like look at weather and neighborhood construction instead of using an average time to complete a job. And so now all of a sudden your precision gets better and better and our truck rolls become more efficient and the company saves money but the other side of that formula is what’s it mean for customers. Our hope is that we’re gonna move from four- hour appointment windows to one-hour appointment windows and that’s a huge impact because the most common call center call related to this is, “Where’s my technician?” When you have an 800 number, that’s a call center, and they do lookups so you start to absorb a lot of cost. So it’s one of those rare virtuous cycles: it’s better for the technicians, it’s better for the customer. It isn’t just that the database moves. It’s that we’re using the database and the application, adding to it machine learning and artificial intelligence so what we learned yesterday we can apply today and have that effected in a very large scale organization. IDG: Is the ability to get smarter from data is that the fundamental driver for this or is it just the overall efficiency for the organization? Donovan: There are three things. One is the liberation of the data, just getting it to be usable by more people. The second is that speed issue; we believe that we should be able to innovate faster but in order to manifest that you really have to materially speed up. And the third thing is that we want to use data as a product, we want to move from -- the way we think of it -- data-generating to data-powered. It’s subtle but I think its an important difference.